Winter is here. I think it means to stay this time. I’m feeling as lazy as can be. It’s a good feeling. It’s been a long time since I’ve felt this relaxed and restful. I have no urge ‘to create’ or do much of anything. Just good old ‘doing’ nuthing.’ I’m muttering and tapping on the keyboard here but I’m not driven with any ideas or messages. I’m just talking. Sheba has been pestering me to feed her early. 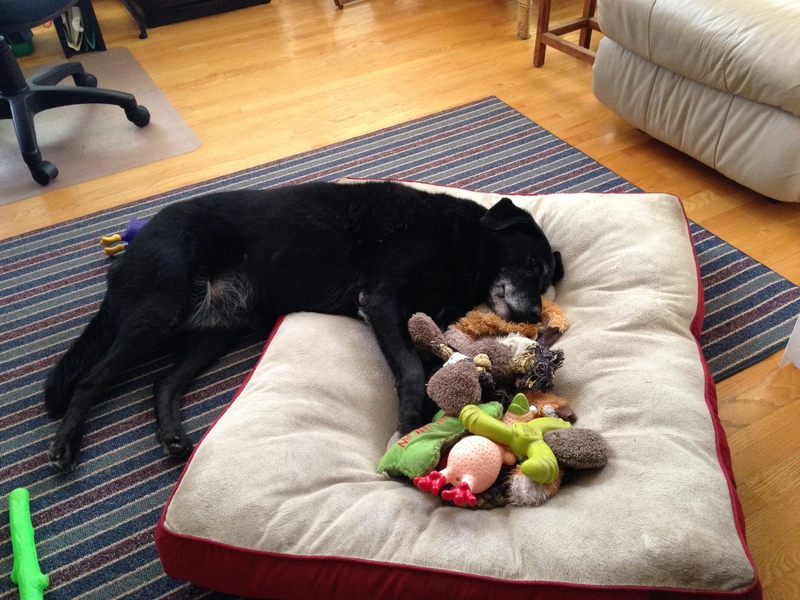 She’s finally given up and is curled up with her stuffed toys. I’m relishing my laziness. I’m remembering those good old days when we had time to sit with each other, have coffee and chat. Why don’t we have time now? We have gained so much with technology and yet we have lost so much to it. We have lost our slow living to fast and expedient doings. I fear we have lost the art of visiting and talking in real life and slow time. I should not speak in the ‘we’. Maybe it is just me who has lost the knack. As you can see, I have grown lazy. I’ve abandoned my habit of showing up here every day. I’ve lost the knack for chit chat. I’ve been overwhelmed with all my doings of living – things I HAVE to do and things I like to do. There’s always a painting, an embroidery, and all those books calling my name. And of course, there’s always Sheba. I’m a little burnt, crisp on the edges. I needed to pull back, let go of some things. I need to be more organized. It is not easy. Today I feel as if I haven’t done much but I don’t feel rested or peaceful. I’ve spent way too much time researching threads and stabilizers for embroidery on Amazon. There’s so many choices. I went back and forth, reading and reading reviews. After much ado and wasted energy, I did finally place my order. Now I am spent. I hope I will be happy with the products when they come. Everything is a learning experience. I will not be so distracted and expend so much effort next time. I will just choose expediently and be done with it. Learning a new skill and a new machine is kind of painful. 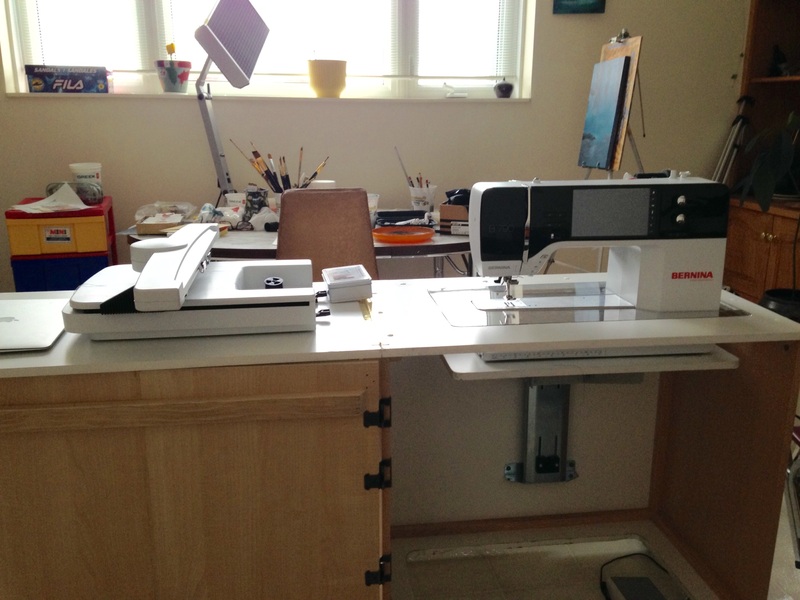 I am still happy I bought my Bernina. After 10 months I can read the manual and understand it. Sometimes I feel like I’m learning how to do surgery. It’s worth it. Now I have to tend to my headache. This entry was posted in Uncategorized and tagged #real life, being expedient, being lazy, learning experience, life, mutterings, overwhelmed, pulling back, slow time, too many choices, writing. Bookmark the permalink. I feel your pain – I research things for hours, even if I’m only buying a toothbrush – But! – I console myself with the fact that I’ve made an informed decision. I’m sure you won’t regret the time you took to investigate your options – and I wouldn’t think of it as a wasted day – I’d consider it Research. Enjoy your sewing and creating! Thanks, Maureen!Sometimes it is so annoying being so indecisive.